Candy Distributing Company | Dorval Trading Co., Ltd.
Dorval Trading Co., Ltd., is the exclusive U.S. importer for an extensive range of high quality confectionery products from major manufacturers in various countries, such as Holland, England, Switzerland, France, Brazil, Argentina and Mexico. 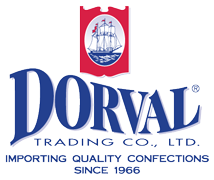 Since its establishment in 1966, Dorval Trading Co. Ltd., has grown to become a significant presence in the Confectionery and Specialty Foods distribution arena. Dorval is a candy distributing company that focuses on developing brand names in the U.S. market through an experienced management, sales and marketing team. Dorval utilizes an extensive network of broker representatives and works with key distributors to gain distribution. Our memberships in multiple industry organizations and participation in major trade shows also allows us to penetrate the U.S. market.